Issue (detail), 1966/2007, plaster, 156 x 4 1/2 x 1/4". Located at the intersection of Minimalism, instructional art, and process-oriented practices, William Anastasi’s works find endless formal possibilities in the most prosaic materials. This exhibition explores the expanded notion of drawing through re-creations of seminal pieces from the 1960s that transform the room’s physical characteristics either gently or dramatically. 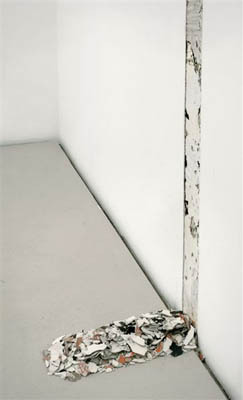 Issue, 1966/2007, consists of a four-and-a-half-inch-wide vertical strip that cuts a gallery wall from floor to ceiling. By chipping away the superficial layers of paint and plaster with chisel and hammer, the work strips the wall bare and turns it into a kind of archaeological site, revealing the gallery's countless lives. The debris is neatly organized on the floor, arranged to resemble a loose continuation of the line cut from the wall. Untitled, 1966/2007, is the result of simple instructions: “With a small cup soberly pour one gallon of paint against a wall as near the ceiling as possible.” A thick, slimy line of black enamel cleaves the wall in two. A delicate balance between material and shape is achieved also in whowasit youwasit propped II, 1965, in which one aluminum beam perches precariously atop another in an unstable ballet that resembles Richard Serra’s syntax but is deprived of that artist’s aggressiveness. Anastasi injects levity into these everyday raw materials, creating a vibrant symphony in which lines, surfaces, and matter resonate in unison.